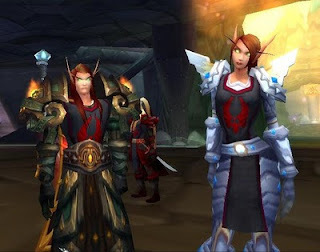 Redbeard has been playing MMOs since September 2009, when Souldat's wife mentioned to him that the two of them were going to return to WoW that fall, and invited him to try it out. While he'd played his share of RPGs over the years -tabletop and computer- Redbeard had never played an MMO before. Therefore, he created his first character, a Priest, expecting the humble Blood Elf to behave much like the Clerics he was used to playing in D&D. One game session was all it took for him to realize that Priests were, well, squishy. Souldat patiently watched Redbeard's Priest struggle along, and suggested that maybe the playing style of a Paladin was what Redbeard was searching for. Quint started as a Holy Spec Paladin and initially favored healing, even after dual speccing to Retribution. However, there were several disastrous incidents in Northrend 5-man instances which led Dr. Quint the Medicine Man to hang up his Healer hat and focus on DPS. When Cataclysm dropped, Red decided to focus on two new characters --one in each faction-- and shuttle Quintalan off to semi-retirement. The new Horde toon, the Sindorei Mage Nevelanthana, was conceived as Quintalan's younger sister. 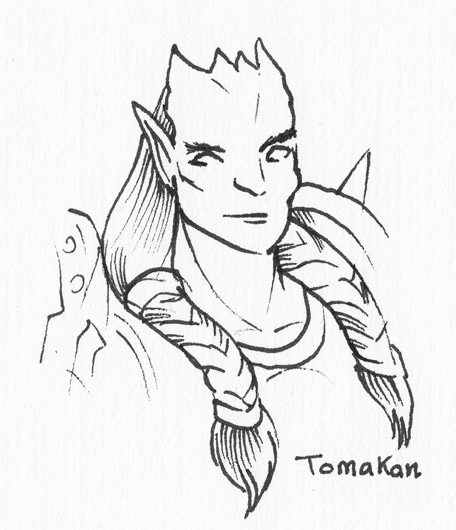 Tomakan, the Draenei Paladin, was linked to Q (from a RP perspective) as a fellow veteran of the Shattered Sun Offensive on Quel'Danas. 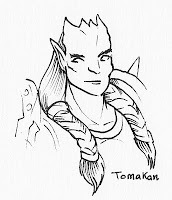 While Tom wasn't Red's first foray into the Alliance side, it became his main once he joined Soul in an Alliance guild and Q's and Neve's old Horde guild broke up. At the end of Cataclysm, Red leveled a Worgen Warlock, Adelwulf, via Battlegrounds to explore PvP a bit more thoroughly. Red kept on leveling Adelwulf despite being a Rogue's punching bag, and reports that this was due to masochistic tendencies are extremely exaggerated. Now, in Mists, Red has started over once more. Tom, Neve, and Adelwulf have joined Quintalan around a table at the World's End Tavern, while the Kaldorei Rogue Azshandra fights her way to L90 via BGs. While WoW might be the most visible MMO Red plays, it is by no means the only one. Sometime in 2010, Red began tinkering around with free-to-play (F2P) MMOs, beginning with Lord of the Rings Online. The gameplay was similar enough to WoW that Red was able to pick up the game well enough, and he enjoyed exploring parts of Middle-earth that he'd only read about in Tolkien's books. He has an Elven Champion, Aranandor, and frequently hangs around Breeland. However, Red's LOTRO activity has declined as he became interested in another MMO, Funcom's Age of Conan. Not too long after AoC went F2P, Red signed up to explore Hyborea. A fan of Robert E. Howard's short stories, he found the material faithful to the books yet not overbearingly so. The gameplay was different enough from WoW and LOTRO that he found it refreshing. Whereas WoW has migrated more toward solo questing, AoC is firmly in the "you'd better group up if you want to survive" camp. Red's Cimmerian Barbarian, Kavaan, is steadily climbing toward max level while he explores the more adult themes (and visuals) of Howard's vision. Red likes both Star Wars and Star Trek, so it is no surprise that he has begun exploring both MMOs. If he'd have his preference, Red would have wanted to explore the world of the original Star Trek, but Next Generation will do well enough. He's only begun his foray into Starfleet as a Vulcan Science Officer, Salaak, but he does like what he has explored so far. Star Wars: The Old Republic generates a lot of heat out in the blogosphere, partially due to it's take on the MMO world, but also due a lot to who developed the game, Bioware and EA. TOR is definitely a love-it-or-hate-it game, and Red falls on the side of "love it". He has toons for all classes except the Imperial Agent, but only has one toon at max level so far: Dalaak the Gunslinger. If you see a toon around from the Duskfighter Legacy, that's Red. In PC, Redbeard provides the viewpoint of someone who is into MMOs from a more social aspect. He isn't that interested in the intricacies of Theorycrafting --which he likens to his old Boundary Value Problems class-- but appreciates the results that others have provided. The quest and exploration side of MMOs appeals to him far more than raiding or end game content, but appreciates the dedication it takes to achieve those goals. He does enjoy Battlegrounds in WoW, but has yet to make that jump in other MMOs. He keeps telling himself that he'll get around to it, but he spends to much of his time questing and socializing in other MMOs that he hasn't dipped his toe into the PvP pool yet. 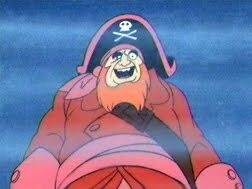 In real life Redbeard really does have red hair and a beard, and is married to a redhead with three redheaded kids. (Gotta love genetics!) He also has a regular blog that can be found here. He tends to work in his MMO playing around family schedules, and tends to play very early in the morning or over lunchtime.